By and large we erroneously tend to think of NVIDIA’s Quadro family of video cards as desktop video cards. While NVIDA has offered mobile Quadro cards for nearly a decade now, it’s largely the desktop versions that get all of the attention in the press, and this outcome is not unexpected. Professional CAD, CAM, and content creation have long been the domain of high-powered workstations, and while notebooks have since taken over the majority of the PC market, the transition in the professional space has been slower. Consequently the mobile Quadro family has not attracted nearly as much attention given the importance of desktop workstations. As the last quarter of 2015 kicks off though, this is a situation that is changing for NVIDIA and workstations vendors as a whole. Intel announced their first mobile Xeon, the Xeon E3-1500M v5, marking Intel’s formalization of the mobile workstation market. And with Intel now more on-board than ever before, for vendors like NVIDIA this means that mobile workstations – though less powerful than their desktop counterparts – may not be playing second-fiddle to desktops much longer. This brings us to today’s announcement from NVIDIA, the Quadro M Mobile series. 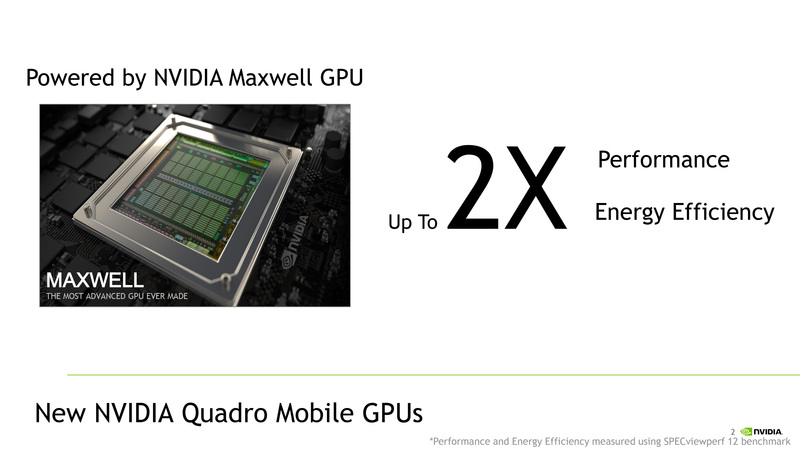 After having updated the desktop Quadro lineup with new products based on Maxwell GPUs back in August, NVIIDA is starting off October by giving the mobile Quadro lineup the same Maxwell treatment. 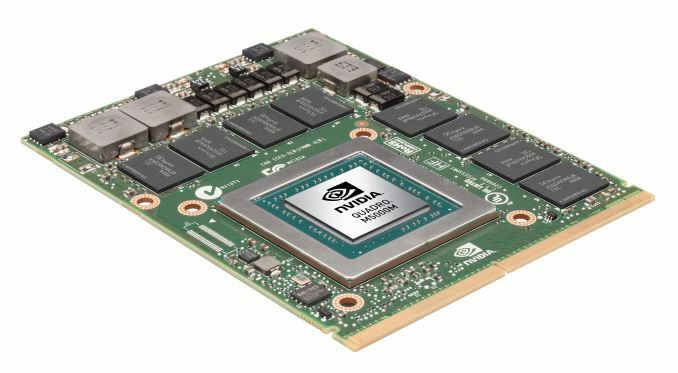 Altogether NVIDIA is launching six new Quadro M Mobile video cards, refreshing the entire lineup from top-to-bottom in a single go. Overall this is a low-key launch for NVIDIA – there weren’t any full press briefings – but I suspect that for NVIDIA the launch of the latest generation of Quadro Mobile parts will be a big deal. The Maxwell architecture’s major gains in efficiency have helped all platforms, but no platform has been helped more than the power and heat dissipation limited mobile market, making mobile the form factor where Maxwell truly shines. As we’ve already seen in the consumer space over the past year, NVIDIA has been able to significantly increase their performance over the Kepler generation while staying within their regular TDPs, and this bodes well for NVIDIA’s Quadro Mobile lineup. NVIDIA is touting an up to 2x increase in performance, and as we’ve seen Maxwell should be able to come very close to that in many mobile workloads. Taking a look at the individual cards, NVIDIA has opted to retain their traditional family-number-mobile naming scheme. This results in these new parts being the Quadro MxxxxM series, a bit of a mouthful of a product name. Digging deeper, the new Quadro parts can essentially be divided up into two groups of cards. The Quadro M3000M, M4000M, and M5000 are all based on NVIDIA’s GM204 GPU. The most powerful of these is roughly comparable to the GeForce GTX 980M, with 1536 CUDA cores enabled. It’s also the only SKU to get 8GB of VRAM, made possible through the use of the recent introduction of 8Gb GDDR5 memory chips. Meanwhile the 1280 and 1024 CUDA cores respectively is the M4000M and M3000M, which use further cut down GPUs and pair it up with 4GB of VRAM. Both the M5000M and M4000M are top-wattage 100W parts, while the M3000M brings that down to 75W. At the other end of the spectrum we have the M600M, M1000M, and M2000M. Post press time we received confirmation from NVIDIA that these parts are based on the company's GM107 GPU, so the Quadro M Mobile family is going to be split between the Maxwell 2 and Maxwell 1 architectures. In any case, these parts are the lower power, lower performance, and lower price members of the Quadro M Mobile family. The M2000M features 640 CUDA cores and 4GB of VRAM, while the M1000M drops to 512 CUDA cores and 2GB of VRAM, with the M600M bringing up the rear with just 384 CUDA cores and 2GB of VRAM. TDPs for these parts are 55W, 40W, and 30W respectively, which means these parts are going to be more practical for thin and light mobile workstations than the 100W heavy-hitters at the high-end of the family. In regards of features, these parts will inherit the standard Maxwell family features, including Maxwell’s energy efficiency improvements and greater media encode/decode support. For the Maxwell 2 based parts (M3000M and up), this includes full hardware support for HEVC encoding and limited "hybrid" HEVC decode support. As for the Maxwell 1 based parts (M2000M and below) this includes a faster-than-Kepler H.264 video encoder and "hybrid" HEVC decode support, but no HEVC encode support. NVIDIA has also confirmed that Optimus will be supported on all of these parts; otherwise in a direct-wired situation, each part can drive up to 4 displays, as opposed to 2 for the previous Kepler generation parts. Finally, as the launch of the Quadro M Mobile series is timed to roughly coincide with the release of Intel’s Skylake processors, NVIDIA tells us that OEM availability will be similar. The parts will be rolling out over the rest of the quarter, with NVIDIA already securing design wins in Dell’s Precision 15 5000 series, Precision 15 and 17 7000 series, HP’s ZBook series, and the previously announced Lenovo ThinkPad P50 and P70. Once again, disappointing FP64 performance. FP64 is very important for workstation workloads.